My recent encounter with Schmidt’s Notre Dame and an upcoming concert performance of Weber’s Der Freischutz got me thinking about neglected Austro-German music of the Romantic and Post-Romantic eras. 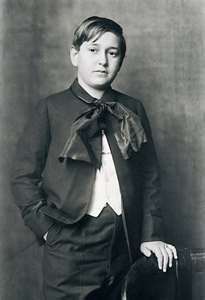 One name that stands out there is Erich Wolfgang Korngold (1899-1957,) the child prodigy composer who was driven from Austria by the Nazis and ended up in the US writing movie scores for Warner Brothers in the 1930’s and ’40’s. After the War, he returned to more traditional forms including a symphony and his violin concerto, but died after a return to Vienna a disappointed, discouraged and largely forgotten man. 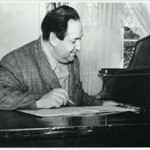 In the 1970’s his son George connected with record producer and conductor Charles Gerhardt to produce a series of celebrated recordings of excerpts from Korngold’s film scores. This led to eventual rehabilitation and revival. 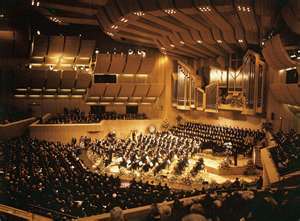 His reputation has grown greatly, even if it does not rival Gustav Mahler’s in clout. The violin concerto is heard regularly. The symphony gets an occasional hearing. His opera Die Tote Stadt pops up from time to time. Korngold’s scores for the films of Errol Flynn, Bette Davis and Olivia de Havilland were the most prestigious in Hollywood at the time. Others composers for the movies were encouraged by the studios to emulate his style. John Williams, the most successful composer for film still alive clearly did study Korngold as he developed his own individual way with film music. Korngold’s lush, chromatic, rhythmically complex music owes something to Richard Strauss but competes strongly on its own. He was the author of five successful operas but in films, he found his perfect medium. 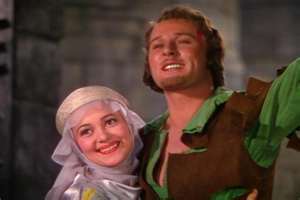 I remember one time watching The Adventures of Robin Hood with Flynn and Olivia de Havilland with my eyes closed, and there was the whole picture in sound— sweeping adventure, heart-breaking romance, dastardly villainy and regal pomp. The problem he faced in the US was that most of the classical music establishment, critics and academics, looked down its nose at movie music. It was no better in Europe. Dismissing a composition as movie music was a common putdown. 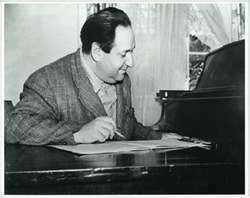 Composers like Korngold, Miklos Rosza and Franz Waxman felt called upon to write in more traditional forms to be taken seriously. Even that was no guarantee establishment figures would be sympathetic. Ironically many of those who looked askance have faded into well-deserved obscurity but at the time they gave Korngold almost as much trouble as the Third Reich. As I listened in the 1970’s to the Gerhardt recordings (recently re-released on CD), I recall thinking that it was incongruous to praise the incidental music to A Midsummer’s Night Dream by Felix Mendelssohn and poo-poo Korngold’s music for King’s Row. Bizet wrote incidental music. Arthur Sullivan wrote incidental music too. So did Sibelius and Grieg — for plays. They did not have the opportunity to supply it for film. Korngold did. So did Shostakovich, Prokofiev, Copland and Bernstein. Why did this form demean the composition? This bias against film music still persists, though it has softened. 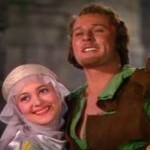 How wonderful it would be to encounter the ‘Incidental Music’ to the films like The Sea Hawk, The Constant Nymph, Devotion and Deception which really represent Korngold at his finest in the concert hall. Esa-Pekka Salonen programmed Bernard Herrmann’s music for Vertigo very successfully. 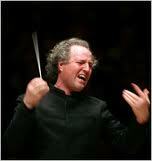 Isn’t it time for other major orchestras to drop the silly bias and follow suit. We do hear pop concerts of film music, even live accompaniments to projected film at places like the Hollywood Bowl, but the works of Korngold, Rosza and Herrmann deserve their places in regular subscription series. It might help attract a younger crowd. It might even save classical music from itself.